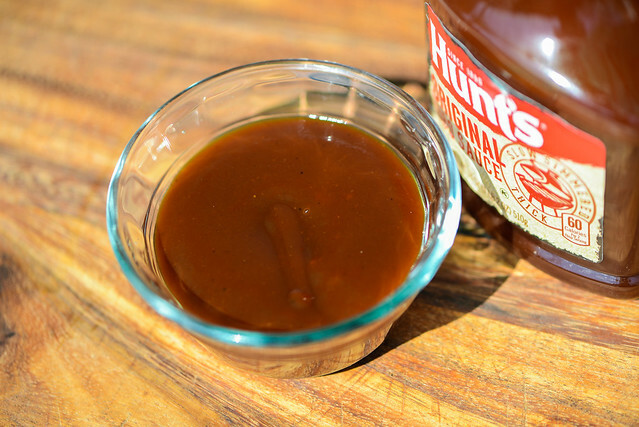 Hunt's Original BBQ Sauce suffers from a blandness that's an oddity in the realm of barbecue sauces. This leaves the sauce almost devoid of the more bold tangy, sweet, and fruity layers of flavor that you'd normally be looking for in quality 'cue. 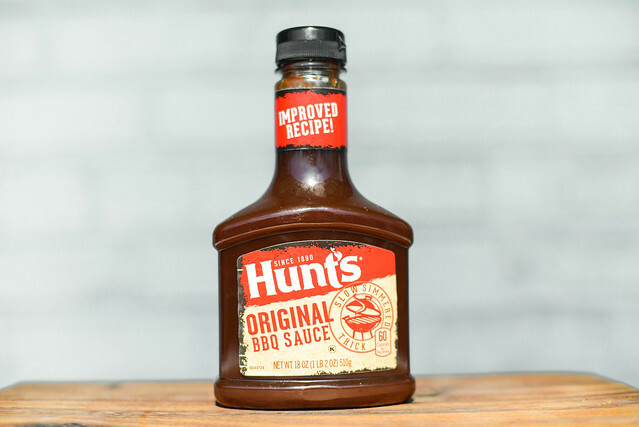 Probably the second most recognized name in ketchup, Hunt's got its start as a fruit packing company in California back in 1888 by Joseph and William Hunt. Although taken over and merged with many larger companies over the years—it's currently a brand of ConAgra Foods—Hunt's still remains close to its origins with a line of canned tomatoes and their logical offshoots, ketchup, pasta sauces, and barbecue sauce. 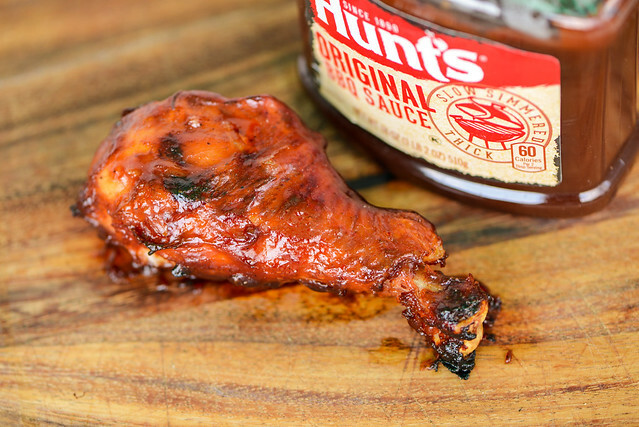 Hunt's presently has three differently varieties of barbecue sauce in their line-up. You get the major components of barbecue sauce on first whiff—tomato, vinegar, and sugar—but it's pretty understated. 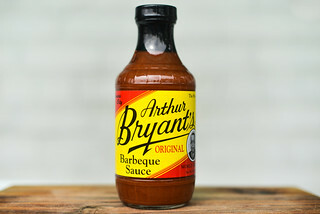 Instead of delivering the common boldness of barbecue, this sauce smells more like a slightly gussied up ketchup. Its primary aroma is of sweet tomato with a mild vinegar tang. There's a slight hint of molasses that adds depth, as well as background notes of onion and smoke. This very smooth and glossy sauce hits right in the center of the thickness scale. It has a syrupy consistency that has it falling in a smooth stream after an initial large drop releases from a suspended spoon. As the flow slows, it begins to drip from the edge of the silverware, then leaves a medium, semi-transparent coating left clinging. In this thin layer of sauce, you can see some small specs of spices peppered throughout. The ketchup-like aroma was a good clue to the overall flavor of the sauce—it's basically a mildly seasoned ketchup. It's actually probably less flavorful than ketchup, and the tomato intensity it cut down with the addition of a lot of corn syrup and a little vinegar. The vinegar isn't enough to balance out the sweetness, so it only creates a mellow tang, while any equally small amount molasses isn't enough to overcome the monotone corn syrup flavor. There's a bit of onion that comes out as the sauce sits on the tongue, but not much else in the spice category—there's almost no heat at all, leaving the final aftertaste one very similar to that start, super sweet ketchup. This sauce coated the chicken in a thick, slightly uneven layer. It never baked down over indirect heat, which is one reason it quickly burnt away over direct heat. There was mild caramelization that did give the chicken leg an attractive appearance. What little flavor the sauce had out of the jar became pretty much nonexistent after being grilled. There was still a bit of sweet tomato, but not much else to speak of, leaving the stickiness of the sauce its main characteristic. 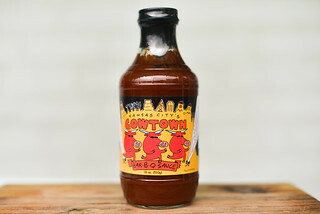 I'm not going to knock ketchup as a base for barbecue sauce—for years I thought I was serving my recipes better by starting with unsweetened tomato sauce as the foundation, but found ketchup actually provided a more pleasing flavor and texture to build off of. The main point in there is to "build off of," and that's what Hunt's Original BBQ Sauce fails to do, create a fully flavored barbecue sauce. The main players are in there—vinegar, molasses, smoke, spices—but in such small levels that they never amount to much of anything, especially against the heavy dose of corn syrup. Pair that with the fact that almost all the flavor disappears after being grill, and that leaves the one of attractive feature of this sauce being it's price, which is commonly less than a two dollars. 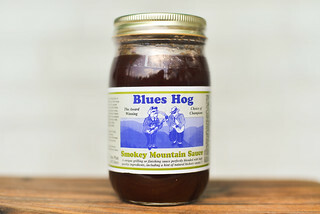 Of course, two dollars spent on sauce that won't do much for your barbecue isn't money well spent. Sad waste of two bucks and a drumstick! I love this sauce and use it all the time with rave reviews.